The integrity of both within-Frio seals and the Anahuac is impacted by growth faults and salt diapers that penetrate the section. 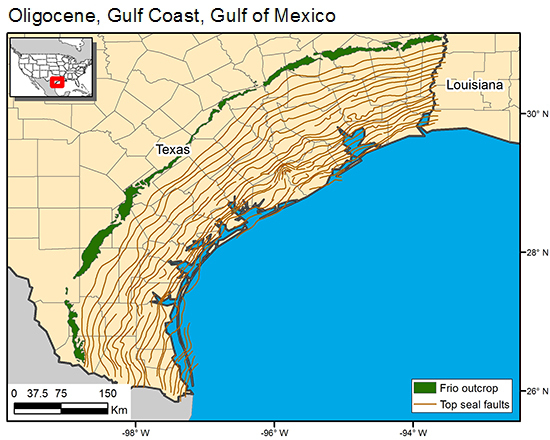 The Anahuac pinches out toward outcrop and the permeable Oakville-Fleming overlies the updip equivalent of the Frio, the Catahoula Formation. Upward leakage along the flanks of at least some salt domes at geologic rates is well documented by fluid chemistry (Macpherson, 1992) and mineralization on dome flanks. Brine leakage though microfractures in shales has been documented (Harrison and Summa, 1991; Macpherson, 1992; Capuano, 1993). In addition, production within and below the Frio should be considered in terms of potential for upward flow along failed casings or improperly plugged wells, as well as in terms of mineral rights and potential for negative impact on production and maintenance. Potentially this area might serve as a fruitful area for investigation of rates of CO2 flux across shales. Capuano, R. M., 1993, Evidence of fluid flow in microfractures in geopressured shales: American Association of Petroleum Geologists Bulletin, v. 77, no. 8, p. 1303–1314. Harrison, W. J., and Summa, L. L., 1991, Paleohydrology of the Gulf of Mexico basin: American Journal of Science, v. 291 p. 109–176.